Considered to be a manufacturing, transportation, and logistics hub, the state of Indiana plays an important role in the nation’s economy. Students who have completed specialized vocational and trade school programs are in high demand, since Indiana faces a shortage of skilled workers in areas of business, construction, transportation and logistics, and STEM. 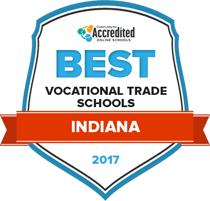 This guide provides information about accredited vocational and trade schools in Indiana, job opportunities for graduates, and resources for those interested in enrolling in a program in Indianapolis or other cities in Indiana. Indiana is home to many types of trade and vocational institutions for students eager to obtain hands-on professional training. Indiana enjoys a diverse selection of growing sectors such as manufacturing and transportation - all industries that rely on the instruction found at most career colleges, vocational institutions and community colleges. Our ranking of accredited schools in Indiana can help students narrow down the options; we looked at factors such as tuition rate, breadth and length of programs and financial aid. Adults interested in pursuing careers like automotive technology, nursing, cyber security and welding could earn an associate degree at Ivy Tech Community College. These degrees prepare students to enter specific careers. Many of the degrees are taught in the Technology Division. The school has more than 30 campuses located throughout Indiana. Campus Connect is the tool that students use to check email, read college announcements, register for classes and review their tests scores. Students can also order textbooks online through Campus Connect. Course syllabi, class calendars and instructor contact information is retrieved through Blackboard. Registration for the semester based classes adheres to set deadlines. At J. Everett Light Career Center, students can take classes that will lead them towards quick entry into the workforce. Vocational programs such as welding or veterinary assisting are designed to incorporate applied learning methods, giving students the opportunity to learn in an environment that will closely resemble their future workspace. Many degrees offered at JELCC give students the option to continue their education after they graduate. Local high school students may also wish to consider dual enrollment with JELCC, as they will be able to fulfill college requirements a year before they actually attend school there. Career and technical education (CTE) programs in Indiana are designed to prepare students for entry-level jobs in their respective fields. These programs also prepare students for admission into four-year universities if they choose to continue their educational track. The Indiana Department of Education sets the standards for CTE in Indiana and encourages schools to create programs that with connections to apprenticeship and on-the-job training that increase students’ employability. According to the National Center for Education Statistics 2010 data report, the percentage of students in Indiana completing a certificate or diploma program of one year or less was below the national average. More students in Indiana choose to pursue an associate or bachelor’s degree. Still, it’s important to consider that many programs available at vocational and trade schools in Indiana can prepare students for a two-year or four-year degree. The U.S. Bureau of Labor Statistics reports the strongest areas of vocational employment in Indiana as of 2015 were in the fields of manufacturing; trade, transportation and utilities; education and health services; leisure and hospitality. Vocational and trade school graduates who focus on these areas may be able to secure attractive jobs in their respective fields immediately after completion and also find internships and other professional development opportunities throughout the state. The following list profiles the top jobs and median salaries for those who have completed postsecondary education or a two-year associate’s degree in Indiana. The majority of Indiana’s trade schools and vocational training centers are located in and around Indianapolis, the largest metro area in the state. Students can enroll in specialized programs at schools focused on technology, healthcare, information technology, or automotive programs. Community colleges around Indianapolis and the surrounding cities offer a range of programs and training for skilled trades occupations. Many offer internship opportunities at Indianapolis businesses so it’s easy for vocational program graduates to find work placement right after school. Several major employers in Indianapolis alone may offer job opportunities for CTE graduates, such as Peyton Manning Children’s Hospital, Indiana University - Purdue University Indianapolis, IU Health, Eli Lilly International Corporation, and IU School of Medicine. Nursing and medical assistants, registered nurses, teachers, and clinical laboratory technicians may be able to find rewarding careers at these area employers. Provides professional development and leadership development opportunities for business students and those pursuing professional careers. Hosts state conferences and other events throughout the year. Committed to promoting career education programs for today’s use. Comprised of teachers, administrators and staff members who want to attend networking events and conferences, and support funding efforts for CTE programs across the state. This organization is a joint effort of the Indiana Department of Education and Indiana’s Career and Technical Student Organizations. Representatives from different organizations plan leadership events and conferences to encourage student participation and help students prepare for their professional career. A student organization designed to inspire leaders, entrepreneurs, and professionals pursuing careers in management, finance, hospitality, and marketing. Hosts career development conferences and other special vents. Designed for students pursuing educational carers in family and consumer sciences. The organization participates in national programs and state projects while helping students develop proficiency and skills through various competitions and events. The Indiana chapter of the Future Business Leaders of America-Phi Beta Lambda is a nonprofit organization and the largest business career student organization in the world. Phi Beta Lambda (PBL) is designed for postsecondary students. Members participate in conferences, seminars, and awards programs. Comprehensive website with information about news and legal matters related to education and state-funded training programs throughout Indiana. Includes higher education resources and links for online license renewals with the state. The Indiana chapter encourages members to participate in educational experiences and team building projects to develop a good work ethic, good communication skills, and strong leadership skills regardless of their occupation. It is focused on community involvement and group activities.